My friends OLI, Tom and I love movies with a passion. We started this blog to share our reviews with you! Constructive feed back is always welcome! Please feel free to comment on our reviews, would be much appreciated. I have seen Sidney Lumet's 'Network' three times now,I have always loved the film and always understood its prophetical aspect, but It wasn't till today's viewing that I fully realized that this film is a complete masterpiece. Howard Beale is weathered television anchor, who is on the verge of loosing his job. At the beginning of his final week Howard announces on the air, that a week from now he will kill himself on live television. Beale becomes somewhat of a mad prophet and captures the attention of audiences as well as the television network, whom is determined to exploit him. We have all heard of how prophetic, intelligent and politically endearing 'Network' is, and how it may be even more relevant today than it was upon release. 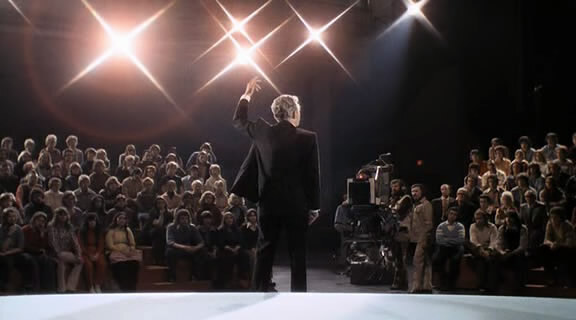 'Network' is a incredibly scripted picture, Screenwriter Paddy Chayefsky is able to put his finger on the pulse of our culture so precisely and so critically that it still feels so telling and relateable to this day. 'Network' represents the epitome of the television generation, the time where machinery and electronics began to take a stranglehold on our society, Emotions took a back seat to power and greed. Through the network letting Howard run loose on national television and seemingly make a fool of himself on a daily basis, is the representation of our exploitative side, and how a the health of a person's state of mind is secondary to personal notoriety,success and of course wealth. The film is the ultimate depiction of the dimness of the future and the loathsome attitudes society has in store for us.Chayefsky's script is just utterly remarkable, hes words will stand the test of time and continue to enlighten and terrify audiences for many generations to come. The film is Directed by Sidney Lumet, one of the most prolific filmmakers of all time, Lumet's efforts with this film are equally remarkable as his other films such as '12 Angry Men' and 'Dog Day Afternoon'. Lumet beautifully crafts the film , and like he did with '12 Angry Men' creates tension and suspense through pure dialogue. In my personal opinion, 'Network' may just be the most well acted film ever made, this cast is the personification of perfect. Faye Dunaway is completely flawless as Diana Christensen, a young heartless woman and is completely driven by her work and personal success, love and other small pleasures of the real world don't apply to her, television is her life. William Holden is as incredible as usual in his role as Max Schumacher, he basically represents the last remnants of the old way, good old television when it didn't have to rely on the exploitation of mad men. Robert Duvall is great as the ruthless TV Executive. Beatrice Straight is remarkable as Max's grief stricken and heart broken wife,her five minutes and forty seconds of screen time saw her pick up a Best Supporting Actress Academy Award. Ned Beatty is incredible as CCA Chairman Arthur Jensen, hes scene with Howard in the conference room is one of my favorite of the film. Peter Finch's performance as Howard Beale is iconic and unforgettable, words really can not do it justice, truly a brilliant performance. I have only scratched surface of the film with this review, Its very ironic that a film centered around a prophet, is exactly that. 'Network' is still frighteningly relevant today as ever, This film may just live on forever. A masterpiece. Thomas Lewry. Awesome Inc. theme. Theme images by moorsky. Powered by Blogger.